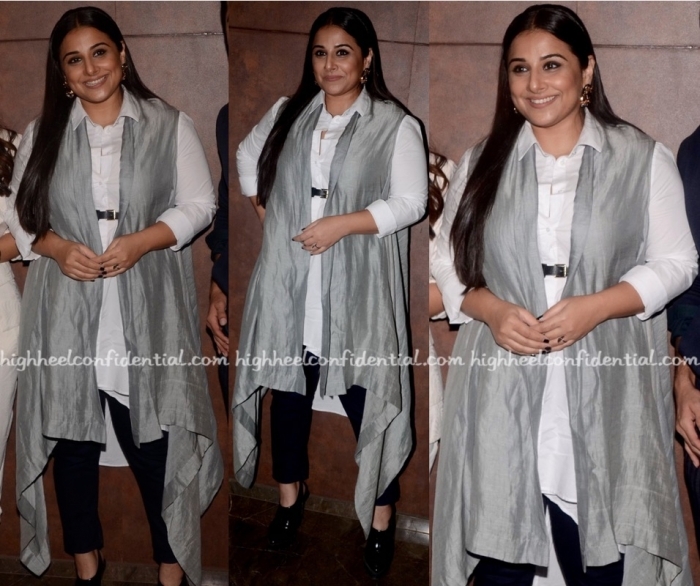 Wearing Ezra, Shweta attended the screening (and promotions) of her mini series in Mumbai. Jewelry from Anaqa and pair of wedges rounded out the actor’s look. Teaming a deconstructed Ezra jacket with pair of sparkly H&M pants, Diana attended GQ awards last evening. Wearing her hair down in tight curls, she rounded out the look with Valliyan jewelry, Prada clutch and straight up lustworthy Saint Laurent heels. Now, the upside- those pumps. The downside- everything else. There’s a lot Ms. Penty can do, however selling us this look isn’t one of them. 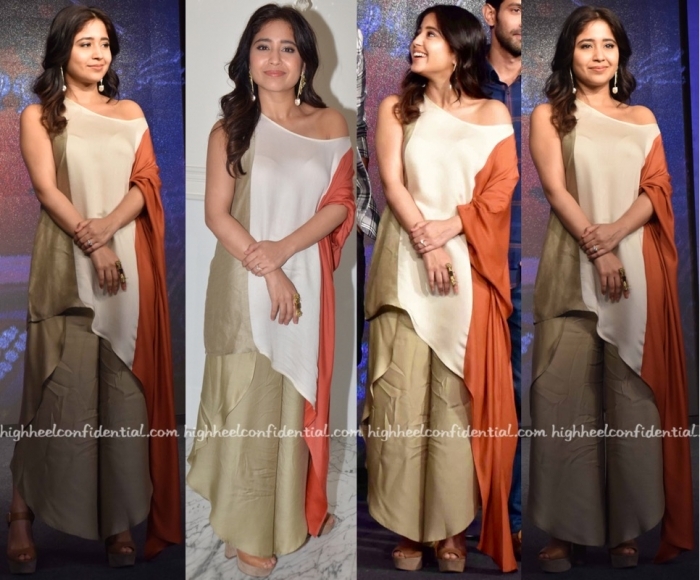 Another clear instance where the stylist’s inspired by ‘whatever-the-current-it-girls-are-wearing’ vision just didn’t translate well. 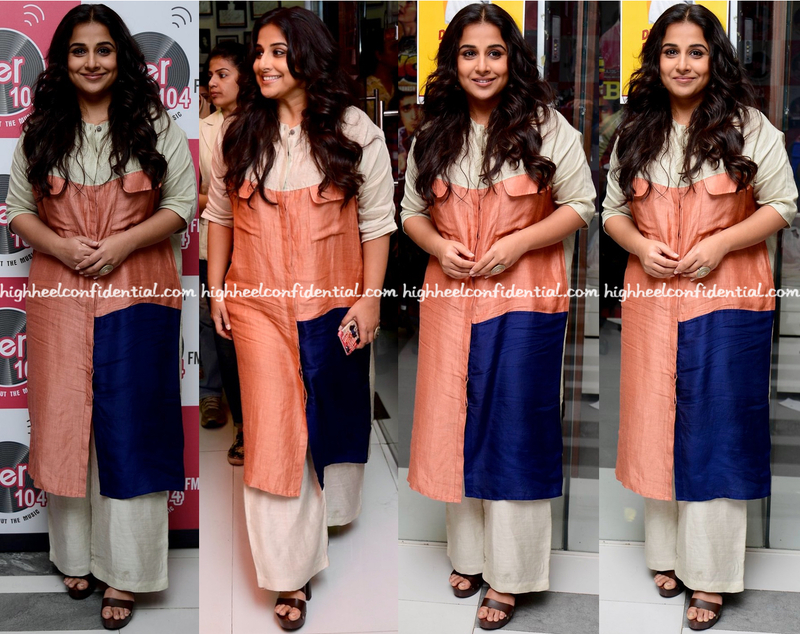 For her appearance at a recent movie screening, Vidya changed things up, and then some. 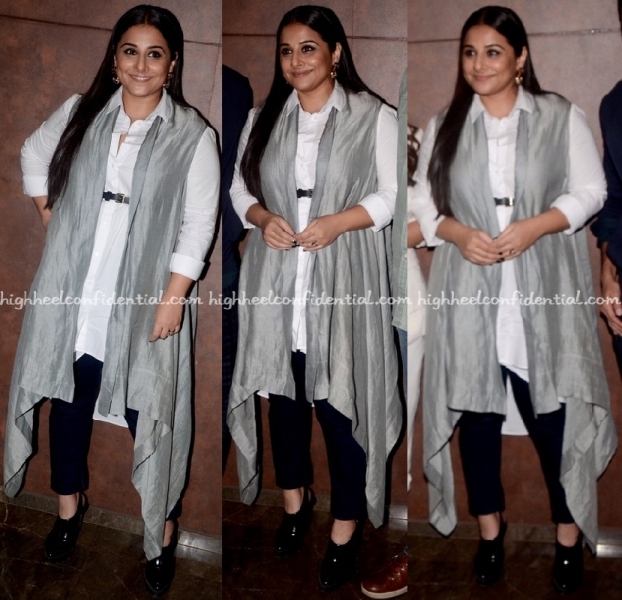 Pairing her Zara separates with an Ezra gilet, Vidya rounded out her with slick straight hair. Her black heels and Outhouse jewelry complemented the look well. Major props for the change in pace; she looked great. P.S: This doesn’t mean we don’t want to see saris. Not by a mile. It’s just that we are happy to see this as well! Wearing a color-blocked Ezra tunic with wide-leg trousers, Vidya promoted her upcoming movie at a local radio station in Mumbai. A cocktail ring and pair of brown sandals rounded out the actor’s look. It’s an easy, fuss-free look that works for Ms. Balan. That said however, wish she had worn her hair back in a ponytail; it really weighed down the look. 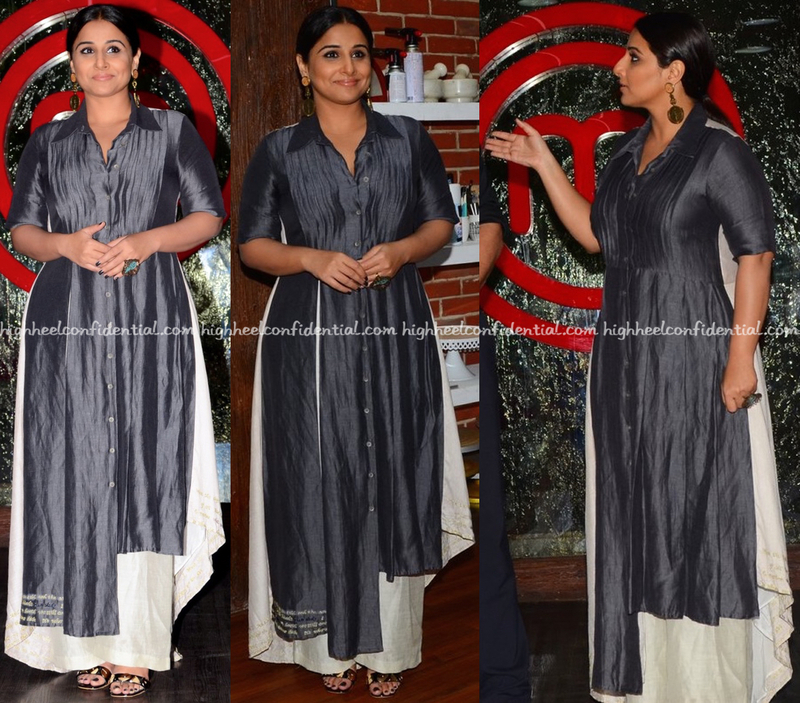 Wearing an Ezra dress, Vidya promoted her upcoming movie on the sets of a television show. 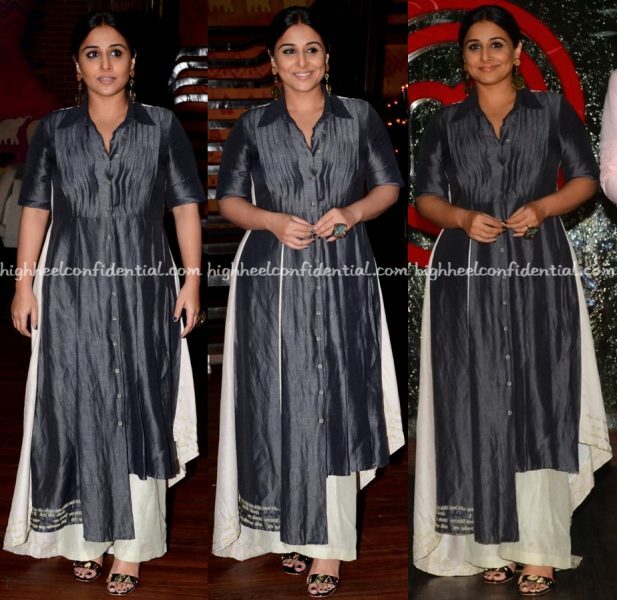 With her hair pulled back, the actor finished out the look with jewelry from Rejuvenate and Pratinava sandals. I wish she had skipped the oversized cocktail ring and picked a silver cuff instead. Only a minor gripe though; Ms. Balan looked nice!